1. With your Sangha watch the 16 minute video featuring DVA contributor, Geshe Thupten Phelgye, on why he is vegetarian. http://www.youtube.com/watch?v=8mBuVU023aM&feature=player_embedded Geshe-la is a student of His Holiness the Dalai Lama, has served for ten years in the Tibetan Parliament in Exile, and is a professor at both Gonzaga University and Eastern Washington University. After watching the video, discuss it using council style rules: don’t interrupt the person speaking, practice mindful speaking and listening, and use Right Speech, ie. speech that is honest and respectful. 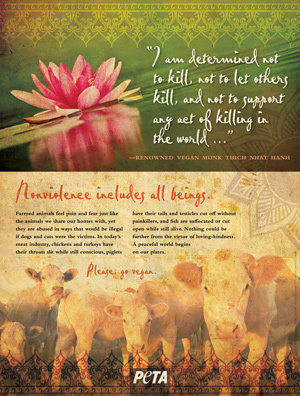 Please email us at https://dharmavoicesforanimals.org/who-we-are/contact-us/ with your questions, comments, and feedback. We want to encourage people to talk about the decision of whether to eat animals in a safe environment. 2. Include the topic of animal suffering in food production in policy discussions and decisions. 3. Include at least one Dharma talk per year on the topic of animal suffering and the Dharma. Record it and give the recording to new members to listen to as part of their orientation. 4. Prohibit the eating of animals at Sangha events. 5. If you have a recommended reading list, include The Great Compassion, by Norm Phelps.